LMFAO, they're filming Amazing Race rn in Toronto! Film crew and helicopters! Amazing Race contestants rappelling down City Hall. Now it's a race to the bottom inside AND outside. Yea there was nothing set up I went in the morning nothing was set up then had to leave. I don't think the rappelling is going to happen at Nathan Phillips Square (City Hall) as per earlier rumours. That may be a decoy location. Camera crew (in orange hardhats) and a sound man (with a boom mike) are set up on a platform at the base of the front face (Front St side) of the (under construction) L Tower (Yonge & Front intersection) right now waiting for teams to head back there. 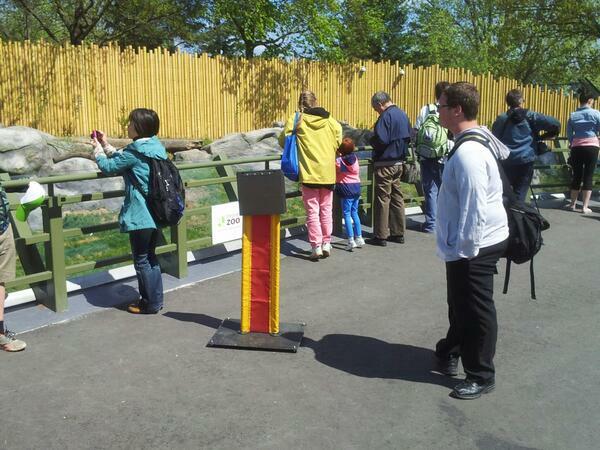 From other tweets, Karolina appears to be at a zoo - Toronto I presume. Just saw the filming of the amazing race Canada at the Toronto zoo! Watching amazing race canada, live! LOL! A sighting from a women's volleyball coach in St. John's who flew from St. John's to Toronto en route to Calgary and saw TAR Canada at the Toronto airport. How did he not see them on the plane? So - without spoiling the final three racers here is what we've seen. More picture and video when we can upload them. Teams arrived from St. John's at 7am ish and were held back by production until 11:15. They were instructed to go to the "L" Tower. Kelsey saw one team and clue boxes at the tower (12:23) - the team told their cab to go to 277 Gladstone - which is the Cadbury Candy Factory Museum. Clue box and race flag seen at Cadbury - along with snarly production... interesting that crew was dressed in "clean room" garb. What we suspect is the last team left Cadbury by cab at 15:34 - on their way to the zoo. Tried to follow their cab, but they lost us - last seen going east on Gardiner Expressway at Dufferin. WP, Here's some background info just to avoid some possible confusion if it should come up. The show Suits is filming in Toronto at Bay and Adelaide St., wherever that is. Probably almost over by now. Nathan Philips Square is a tourist trap yet I'm here since apparently Amazing Race Canada's filming here. Then again, she doesn't actually say she's seeing anything happening. There was nothing set up at Nathan Phillips square when I was there until 1230 . Saw some guys from @AmazingRace_CBS at #TorontoZoo today! I have reason to believe that Amazing Race MIGHT BE in winnipeg today. I have a friend who works at Tims who got a phonecall from Amazing Race, and they ordered a bunch of donuts and coffee to pickup for May 25. It may just be for the crew I'm thinking but that means contestants will be in Winnipeg right? ?